Many people, bent on getting buffed muscles, do not realize that the methods often heard about are wrong for getting what they want. For instance, the theory that thin people must use steroids to build up their muscles is totally false. Yes, many skinny people do have a hard time putting weight on even if they eat every hour. Many skinny people have a predisposition to stay skinny. It is called genes and those genes inform the body that it must use a lot more calories to do a certain task. Although this may be the case, there are still “healthy” ways a skinny person who wants to add on muscle to their body can do so. The majority of people looking to gain muscle mass quickly will consume more food and start a weight-training program. By doing this, their body will take in additional nutrients so that the muscle mass level begins to rise and the hormones needed will also increase. How can you build muscles quickly? Your weight-training program should be made up of free weight exercises. The premise behind it is to stimulate the muscle fibers. The program should comprise of body weight exercises like pull-ups and dips. It should also have free weights added to the mix such as barbells and dumbbells. Be sure to do some changeable resistance gear exercises too. 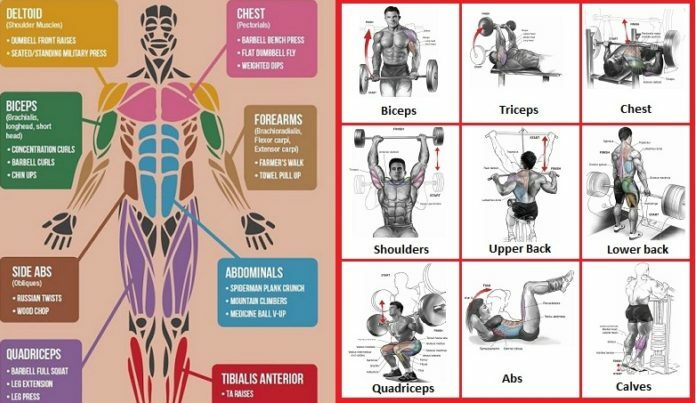 It doesn’t matter why you want to build muscle mass, only that you get the right kinds of exercises to achieve your goal. For instance, you’ll want your muscle fibers to become stimulated so be sure to exercise them. If you want bigger muscles, you’ll need to do some compound or multi-joint exercises along with exercising different muscle groups to get the results you want. When you do these exercises, you give your body the signal to increase the muscle fibers. As they increase, so does your ability to build your muscles quickly. Be sure to include and substitute light and heavy weights to the concoction to get the results you desire. If you want to gain muscles quickly, utilize the five exercises below to help you out. – Bench press – Good for your chest, shoulders and triceps. – Overhead press – Helps in the areas of your shoulders and triceps. – Bar dips – Works on the areas of your arms, chest and shoulders. – Squats – Will work on your legs and lower back. – Pull ups – Wonders for the shoulders and triceps. – Barbell Rows – Again, works best for your shoulders and triceps. Any exercise or weight training program where you are aiming to gain muscles should have a diet that you are following. It should be high in animal protein including eggs, beef, fish, whey, cottage cheese, etc. Make sure you also add in vegetarian substitutes like soy protein or tofu. When you combine the right exercises with the right diet, you get the results you want. Do not forget to include other groups into your diet such as carbohydrates and fats. You can find these in many pastas, sweet potatoes, potatoes, oatmeal and rice. Add in green leafy vegetables and fruits to your weight training diet.